Aleurites are small trees, natives of eastern tropics grown primarily for their seeds which produce an oil used commercially to produce lacquers and furniture finishes, and in electrical wiring insulation. The trees thrive in well drained loamy somewhat acidic soil and grow rapidly. 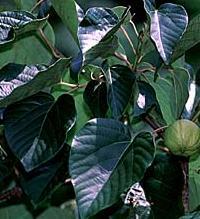 They are often grown in warmer climates (such as the southern US) as a shade tree. Aleurites have heart shaped slightly lobed leaves and blooms are monoecious (both male and female flowers are found on the same plant). The very attractive blooms are white, five petaled with a pink eye. Aleurites may be propagated by sowing seed in spring. The outer hull should be removed from the seed and the seed cold stratified for 60 days prior to planting for best germination.